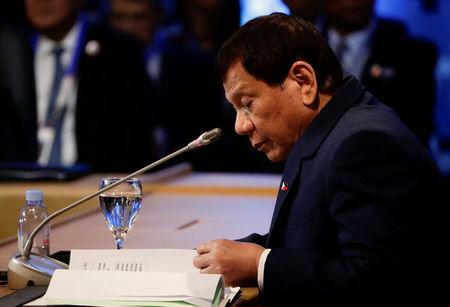 MANILA (Reuters) - Philippine President Rodrigo Duterte said on Tuesday China had "graciously" agreed at a summit of Asian nations to start negotiations towards a code of conduct in the South China Sea, and would abide by whatever was decided. Duterte said China had also agreed that access to waterways and airspace in the South China Sea would be "unbridled" and "unfettered". He also said North Korea's missile tests were a concern to every leader at the Manila summit meetings and people should pray that there was no conflict on the Korean peninsula. Pyongyang, he said, was "toying" with bombs.